When all the votes were counted after the June 7, 2016 Primary Election, David Berger earned a well deserved victory and a place in the November 8, 2016 Runoff election. There were five candidates vying to replace retiring Judge Elden S. Fox in the primary election, so outright victory was never a possibility. The goal was to secure a place in the runoff by being one of the two top vote-getters, and that is exactly what happened. Of the original five candidates for Office No. 158, three were prosecutors which had the inevitable effect of splitting the vote for prosecutors. Prosecutors have historically done well in Judicial elections, and the 2016 primary was no exception: The three prosecutors polled a combined total of 53.19% of the vote, and David Berger emerged as the clear top vote-getter of the group, 10 points ahead of his nearest rival. In the primary, voters had a difficult choice; Which of these three prosecutors should I vote for? The November 8, 2016 runoff will be a much clearer choice for voters as there will be only one prosecutor in the race for Office No. 158. Experience matters. David Berger has 20 years experience handling, settling hundreds of cases, and trying those cases that could not be settled. That is why both the Metropolitan News-Enterprise and the LA Times endorsed David Berger for Judge with the Times saying "Berger is the best choice" and the Met News saying "One candidate in this race stands out: Los Angeles Deputy District Attorney David Berger. Composed, articulate, and knowledgeable, he would run a court in a steady and effective manner. Berger has a quick mind, and would render reasoned decisions without long pondering." And so the Runoff campaign starts and will continue through to election day. The goal now is to let the voters know that in the race for Office No. 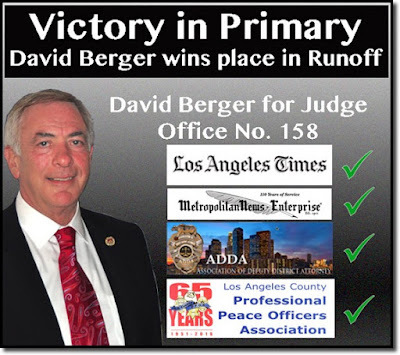 158, David Berger is only candidate who has experience trying cases in Superior Court, selecting jurors, examining and cross-examining witnesses, conducting evidentiary hearings, and presenting and arguing motions. Experience matters. That's the message that will resonate with voters.